Start early and plan ahead: A year in advance is enough time but don’t dawdle. Check out some of the reputable and experienced golf travel companies and begin reviewing their itineraries. Some of the regional and national firms may seem pricey at first—especially if you’re traveling during the prime summer season—but their major advantage is that often have blocks of guaranteed tee-times. They also remove much of the worry and stress about all of the details and that shouldn’t be dismissed just to save a few bucks. Remember: they’re travel pros and you’re not. Yet, for the more adventuresome, self-drive trips deliver more independence and are less expensive. In either case, www.DiscoverIreland.com is a good place to start. Golf Bag and Luggage: Give your back muscles a rest by using durable, soft-covered luggage and golf bag covers, each with built-in wheels. And a light-weight carry golf bag is also essential. Packing: Ireland has fickle yet mild weather. Depending on the time of the year, you can’t go wrong by packing some Under Armour-type long sleeve shirts, some turtlenecks, windbreakers, vests and some sweaters. Create a packing list and finish it at least two days before departure. Don’t over-pack. Wearing the same woolen sweater twice or more won’t offend anyone (especially the sheep) and you’ll probably buy a new one anyway. Of course, a quality rain suit, rain hat and water-proof golf shoes are all must items. Clubs: Forego the “four wedge system” and instead think ahead and imagine playing courses more on the ground and less in the air. For most golfers, that’ll mean more hybrids and also relying more on your putter and higher irons for pitching and chipping around the greens. Don’t be surprised to see your partner use his putter from twenty or thirty yards short of the green—especially if it’s windy which it will often be. The First Day: It’s best to stay hydrated and get some winks on your transatlantic flight. If possible plan your itinerary so that your Day One destination is not too distant. It’s body-smart to get outside in the daylight and in the fresh air and play nine or 18 holes, have a light dinner and then hit the hay, getting as much sleep as your internal clock will allow. Regardless of your routine, you’ll still be wiped out. Trolley: Unless your back’s in great shape for carrying your bag, consider renting a trolley (pull cart) or even a battery-powered trolley. Avoid riding at all costs unless physical impediments compel you. As a wise Irishman once told me, “Riding in a cart destroys the journey of the game.” Walk and savor the course and the surroundings. And feel wonderfully spent at the end of the day. Courses: Ireland has some fine parkland courses (Adare Manor, The K Club, where the Ryder Cup was held, Mount Juliet, Druid’s Glen, to mention only a few) but its golfing spirit may be forever found at its incomparable links courses. Don’t attempt a whirlwind 36-holes-per-day tour to knock off your bucket list on your first visit. Instead, consider visiting a region of Ireland where you can hunker down and play several courses, some even more than once. As far as courses, you can never go wrong with the ones that reside on the celebrated “best” lists. 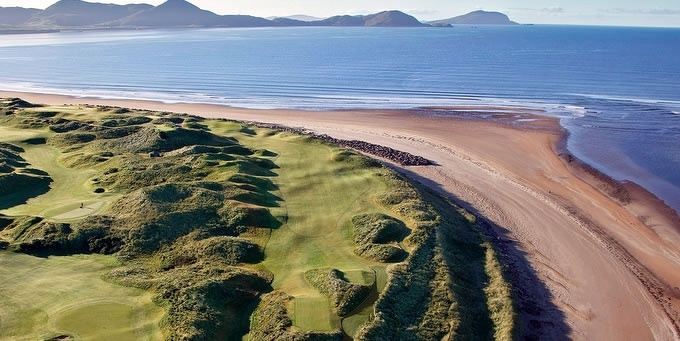 For me, my favorite links courses in alphabetical order are: Ballybunion (Old), Ballyliffen, Carne, County Louth, County Sligo, Ceann Sibeal, Connemara, Donegal, Dooks, Doonbeg, Enniscrone, European Club, Island Club, Lahinch, Old Head, Portmarnock, Royal County Down, Royal Portrush, Tralee and Waterville. The Game: Don’t be score-conscious slowpoke! The only thing worse than seeing a fellow Yank getting bogged down by pre-shot and distance-gathering routines is watching another one all angry and frustrated by poor shots, bad bounces and lost balls. For goodness sake, you’re on a golf trip not the final leg of Q School! Enjoy your privileged travel experience, your companions, the vagaries of the game and the soul-stirring terrain. Play with dispatch and imagination. And if you and your group need some competition rely on kinder-on-the-psyche match play or Stableford instead of the plodding hole-it-all-out medal play. The Irish: The golf will be memorable. But the Irish people, so historically tied to the U.S., will be wonderful and affable hosts. So take time to savor the sights, attractions, and these warm-hearted people. A pint or two amongst your new Irish friends will take the edge off even the most embarrassing shank. Top-notch share on Tips for a Successful Irish Golf Trip Terry Moore.. It is actually among the most helpful that I’ve come across in a very long time. We’ve been looking for this info.